Preheat oven to 350°F and prepare 9x11 baking dish with cooking spray. In medium bowl, make filling by tossing ½ jar of Classico Riserva Eggplant and Artichoke Sauce with the diced red peppers, artichokes, chopped mozzarella, salt and pepper. Lay out the pounded chicken breasts and spoon the filling into the center of each breast, leaving space on the sides. Roll each chicken breast and place seam side down in the baking dish. 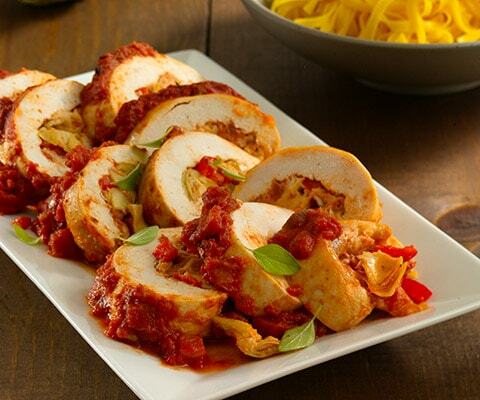 After preparing all four chicken breasts, cover with the remaining Classico® Riserva Eggplant and Artichoke Sauce and cover dish with aluminum foil. Bake for 40-45 minutes or until chicken is fully cooked.